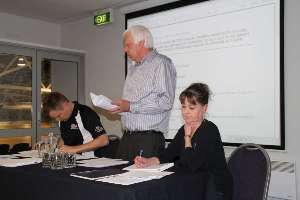 The 2011-12 Annual General Meeting of Cycling Southland was held this evening, reflecting on the twelve month period to March 31 2012. Lindsay Jordan was returned for a second year as President with Sier Vermunt elected as Vice-President. Tony Hammington and Alistair Adam filled the two elected Executive Committee positions while Dave Beadle, Erin Criglington and Waine Harding were appointed selectors for the coming year. Tony Ineson was again appointed as Cycling Southland patron. Click here to read about Lyn Randall's Life membership, awarded on the night. Below you'll find links to the President and CEO Reports and our audited 2012 Annual Accounts. To say it has been a busy year is an under-statement. Much has been achieved with much more to do. Right now we are in the thick of the single most exciting time for the sport. In four weeks we will deliver a world championship event. Through hard work by a huge number of members we have been able to resource and fund this event without negatively impacting on our day to day business – the business of putting people on bikes at all levels. As an organisation, we haven’t made a big fuss about this but I believe it should not be glossed over. Even with the spectre of the impending Junior Worlds, our bread-and-butter remains our club and community road and track racing and programmes and it is the strong delivery we have seen at this level that I am most proud of when I look back on the last 12 months. Financially, in a challenging environment, we have delivered a strong financial result with a $7005 operating surplus for the year. As you will be aware, the significant surpluses generated from recent years through the outstanding support from our funders, most especially the ILT Foundation and Invercargill Licensing Trust, were generated with a view to bringing an event the scale of these World Championships to Invercargill. Cycling Southland’s financial commitment of up to $100,000 to the event has seen $46,639 provided to the Junior Worlds company to date over the last two years. Rather than hold this full contribution over to next financial year, we have elected to expense the funding provided to Junior Worlds to date, in this year’s accounts - which you will note has been added “below the line.” The remainder of Cycling Southland’s contribution will be expensed in the 2012-13 accounts. I would like to take this opportunity to thank all of you for all that you have achieved over recent years as it is only thanks to all of your hard work over all that time, that our organisation is in the sound position it is today with an ability to bring World Championships to a province like Southland and deliver the breadth of activity for novices to world champions alike. I am very aware that this is something that all of those who have been part of our wonderful organisation through the years, should legitimately share in, as the world comes to ride next month.